“We are going to try to keep our defence a little deeper, bring the midfield a little deeper, and then hopefully counter-attack them”. Ian Holloway. Ian Holloway had made no secret of his plan prior to the game and for the most part it worked well, however, individual errors in defence and poor movement from his forwards ensured that chances created weren’t clear cut as Chelsea controlled large parts of the match and deserved their comfortable win. Blackpool had a selection dilemma ahead of the game with Charlie Adam and DJ Campbell both suspended. Holloway chose an unfamiliar line-up with David Carney, Jason Puncheon and Andy Reid slotting in to the midfield and Stephen Crainey coming in at left back. With the ball Blackpool shaped up in a 4-2-3-1, however, out of possession the team sat deep and the forwards dropped back leaving James Beattie as a lone forward and Blackpool shaped in to a 4-5-1. It was Holloway’s intention to sit deep and try to hit Chelsea on the counter, the selection of David Carney on the left wing hinted at giving extra defensive protection down that flank. As a part of this defensive approach Keith Southern and David Vaughan both sat deep out of possession, but with the ball both broke forward with David Vaughan often becoming the spare man in midfield and more advanced than Southern. Chelsea set up in a 4-4-2 but they applied it with very aggressive positioning so it was different to a regular 4-4-2, however, this may have been due to the fact that Blackpool were happy to let Chelsea have the ball and invited them on to them. Chelsea’s midfield four sat very narrow with Ramires on the right and Zhirkov on the left tucking in tight and the width was provided by both full backs pushing up high in to midfield making almost a six in midfield. As Chelsea advanced in to the attacking third it appeared as if Michael Essien’s brief was to drop deep to cover defence. However, Chelsea in the pass were very one paced and they lacked any dynamism which wasn’t helped by Torres and Drogba being very static and flat up front. The introduction of Solomon Kalou injected the right amount of movement and change in pace of pass to provide the difference between the two teams. 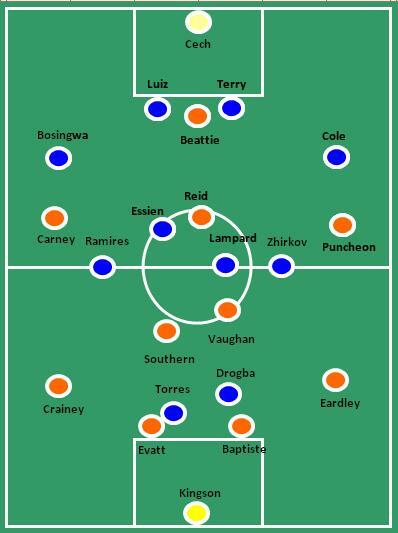 On the left Blackpool sit deep and Chelsea's 4-4-2 takes up an aggressive position. On the right, how Blackpool would normally set up when defending. Chelsea enjoyed good spells of sustained possession, however, rarely threatened to open Blackpool up, it was poor marking from a corner that notched their first goal. After that Blackpool enjoyed their best period of the game with both Southern and Vaughan finding their rhythm in the pass and in breaking up the opposition. However, Blackpool were very static in their forward movement and James Beattie struggled to ascertain any dominance in the air which could have given them a platform to build on winning 3 of his 7 duels. The second half again saw Chelsea control the possession for large parts, but it was the enforced substitution of Salomon Kalou for Didier Drogba which changed the game. Kalou dropped deeper, made direct forward runs, gave short passes and moved which essentially lead to much more dynamism in attack from Chelsea which caused Blackpool’s defence to be pulled out of position leaving them exposed to error. Kalou came on and was safe in possession and penetrating completing 17 passes in his 35 mins on the pitch. Drogba had 9 successful passes in the previous 55 mins. Blackpool’s late flurry came from a double substitution which saw Holloway revert to three forwards giving a more varied point of attack which really started to cause Chelsea problems. Stephen Crainey also started to step up in to attack as Blackpool finished this game as they start and play most. A key observation of both teams is how they differed in the pressing of their opponents. Blackpool normally press all over the pitch and their defending starts with the forwards. In this match they let Chelsea have the ball and only pressed hard when Chelsea advanced to within 35 yards of the goal. Whilst Chelsea pressed from the front, almost hunting in packs to expose Blackpool’s players on the ball and a perfect example of this came in the build up to the penalty. Both Ashley Cole and Yuri Zhirkov pressed Jason Puncheon, forcing the error in possession. When Blackpool found their rhythm after the opening goal they started to break up Chelsea, all but 2 of their 8 interceptions came in the 25 mins up to half time. Apart from that Blackpool let Chelsea dominate on the ball. You can see the difference in the two teams pressing in the Chalkboards below. 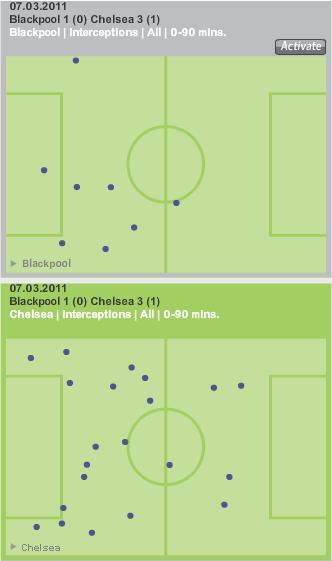 On top Blackpool pressed only when Chelsea came close and that is where they intercepted. However, on the bottom Chelsea pressed all over with great success. It should be clear to most observers of the Premier League that Blackpool have a first eleven that is worthy of staying in this league, however, the real question marks hang over their strength in depth. Ian Holloway will be pleased with some performances in this match, particularly from Jason Puncheon who appears to listen to his manager and adapt to game situations. Blackpool will be near full strength for the away trip to Blackburn later in the month and should provide a stern test for their Lancashire rivals. Chelsea on the other hand are a side who can and will beat anyone on their day and may still have a large influence on how this Premier League turns out by game week 38.